When we go into silence the first thing we do is to clean ourselves. It is a time to sort out whatever is in our minds. When mail at the post office needs to be sorted out, the people there don’t feel overwhelmed by the huge amount of mail. They don’t have the feeling – how can I deal with and deliver all this. In silence it only takes a minute to do this sorting and delivering. When the soul is in the body, mind and intellect function, the physical senses function, the breath functions, thoughts move within the soul. The soul is here and so my eyes are able to see, my mouth is able to speak. By going into silence we become the master of all of these senses, otherwise we become slaves. What is the state of mind of a slave? He makes effort but what return does he receive? The human soul has become enslaved. Sometimes it feels as if the birds and animals are more free. A bird doesn’t depend on anyone. It is able to find its own food. When someone has a horse they look after it very well. They feed it, massage it, polish it and so it then works very well. The mind too is like a horse but neither are we feeding it nor are we looking after it well. And then we complain that it is not able to look after us. Remember that this body is your chariot. The mind is a horse. Look after your mind with love and it well help you travel around comfortably. Let me appreciate the need to go into silence. If I want to have harmonious relationships and do everything well, I need to take the tablets of patience, love and peace. Without patience and love, peace isn’t possible. Through silence I need to fill myself with these. 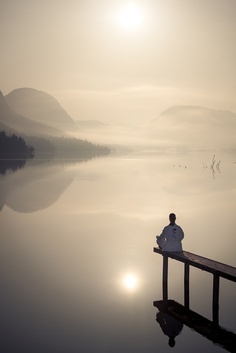 If I haven’t filled myself with this power of silence every morning, then through the whole day, dealing with different situations, handling every task, coming into interaction – I am going to find that I come to standstill. I am not going to be able to manage. I can never say to someone, “Because of you I feel like this.” It’s not my honour or my dignity to say that because of the situation or because of this person I’ve lost my inner strength. I can’t blame someone even by mistake. If I blame someone that’s my mistake. It’s my mistake to become impatient. The intellect needs to be very clear to be able to understand the self and others. Sometimes people don’t even try to understand each other. They try to explain to others but they don’t try to understand the other. They will say “But why don’t you understand what I want to say.” A mother will see what the child needs and give the child accordingly. A teacher will understand what the student needs and give accordingly. I need to take the time and patience to understand what others need. For this one needs a lot of silence inside. With peace let me understand the other. Then the thread of love can be linked. When there is that love there is the possibility that the things that they can’t share with others, they will be able to share with me. There has been a lot of deception and lot of sorrow and so human hearts are filled with this. It is difficult for them to trust another, to explain exactly what is going on. They feel embarrassed and their self-respect becomes low. So if instead of giving them that space and listening to them, I just continue to speak, they won’t really be receptive and be able to understand. To ensure sweetness in relationships, let me never insist or force that someone does something. I can give my suggestion but I must never insist. I also mustn’t reject somebody. Whatever it is that they are saying I mustn’t say “No” and reject them. Finally, I mustn’t have disregard for anyone. Once someone has a feeling of disregard from me then there is a lot of sorrow. If it’s someone younger than me I must give them regard because that is what they would like from me. If someone is my equal let me keep them in front of me and keep that regard for them. If someone is senior to me then definitely I must always have regard for them in my heart. What does silence mean? In silence a very useful thought, a thought to do something good arises and as it arises there is the feeling that it will happen for sure. God will give His power and with a lot of love everyone else will give their help and co-operation. The task is achieved. If a task is given God also gives the strength with which to fulfil that task. All I need to do however is make sure there is no wrong thinking and no wrong words that are spoken. If I am successful in this then there is the experience of peace. No matter what happens, no matter how big a situation or what the circumstances might be, I should never have a thought of revenge. Not even one thought. I shouldn’t be afraid. I shouldn’t callout in distress. I shouldn’t have to ask for God´s help out of desperation. All this power comes from silence. Even if a situation is as huge as a mountain it should become a mustard seed. Internally there is that deep stability that everything is going to work out fine. Exams, that is, situations will come but my consciousness should be up above. If I have a good relationship with the One up above I keep my mind up above and so am able to go beyond the situation. The situation gets resolved automatically. Silence gives us the power to be detached and rise above. If we don’t have this inner power of silence then we get caught up and trapped. We become afraid and overwhelmed by it. Let me be a cloud that showers from up above and makes others cool, not one who remains in the heat of the situation down here. With silence we are able to make ourselves so light that we are able to develop wings. Be light at every moment, draw His might and you can grow wings. Some people need to be pushed and sometimes people are pulled. Sometimes you push someone and they move forward but if others pull them they get distracted and come back to where they were. If I am so easily influenced then what’s happened to my dignity? My feelings shouldn’t change or be influenced by the response of people around me. I should be able to maintain good feelings continually. My intentions also should always be clean and pure. I shouldn’t come into the influence of someone else’s nature to the point where it affects my intentions. People love nature but what I have to look at is what my own personal nature is like. My nature should give happiness to others. I shouldn’t give or take sorrow. If I develop the nature of giving and taking sorrow then nature outside won’t help me. Nature needs our good vibrations. Nature wants to give us happiness but we are not even able to give happiness to each other. When there is no rain nature dries up but let my nature never dry up and be bereft of love. Nature also needs people to care for it otherwise it just becomes a jungle. Who is going to look after my nature inside though? With God’s teachings let me make my nature such that there is nothing but love and respect in peoples hearts for me. For that my intentions need to be very pure, clean and elevated, intentions of truly bringing benefit to all. Never let me think ill of anyone. Let these feelings always be there. In relationships, in actions it is these feelings that will filter through and work. They will work for the whole world. Sit in the boat of truth. Simply be comfortable and the Boatman will carry you to your destination. If the boat were simply to stay at the ocean shore and not go anywhere it would be of no use. The boat sits on the waters but what happens if the water comes in the boat? So by all means live in the world but with truth keep going across and beyond. Let me not allow the sorrow of the external world to come inside. Then I will not say what can I do? How can I do it? If I allow external things to penetrate inside then neither can I go across nor can I help others to do that. So in silence we are preparing ourselves to be very alert and cautious so that the external doesn’t come inside. Influences from outside, oppression from outside, dislike for anyone – none of this should go inside. Then sitting in the boat peacefully I can go across to the other side. If these thoughts are going on they will destroy my peace. What will you achieve by going into these things anyway? I mustn’t create enmity or increase animosity with anyone. Just stay peaceful and quiet and you will find solutions. I can be fearless if I am free from animosity. That brings safety and security. Now you know what silence is. Through silence one is able to accumulate power within. There should be no leakage of that power though. Then you will be full. Sometimes there is a hole and all the peace disappears very fast. So in silence check – is there any leakage or doubt? Stay peaceful. Dadi Janki is a Spiritual Teacher and United Nation’s Wisdom Keeper. She is the co-administrative head of the Brahma Kumaris World Spiritual University.